Benjamin had his 2nd grade awards on Wednesday. He did really well this year and we are crazy proud of him. 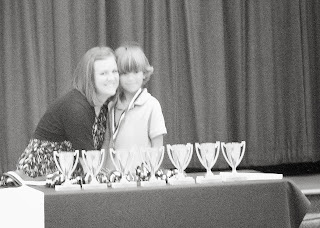 He was awarded 6 different certificates, was recognized in Run Club where he ran over 54miles, read over 1million words (2 million but who's counting besides me). He is over the level the teachers are allowed to test in reading (meaning they are only allowed to test up to 5th grade and he was well beyond that level). He scored really well on the Iowa Assessment and is now in the GATES program. He's a pretty cool kid.